Candy apples made with a coating made from melted Red-Hots will warm your heart and make your mouth happy. In my opinion, Fall can be summed up in three words: apples, candy, and pumpkin. This recipe for Red Hots candy apples contains no pumpkin, but it's got enough apple and candy superpower that I'm willing to shrug and say "two out of three ain't bad". Actually, far from "not bad", these are really quite great. 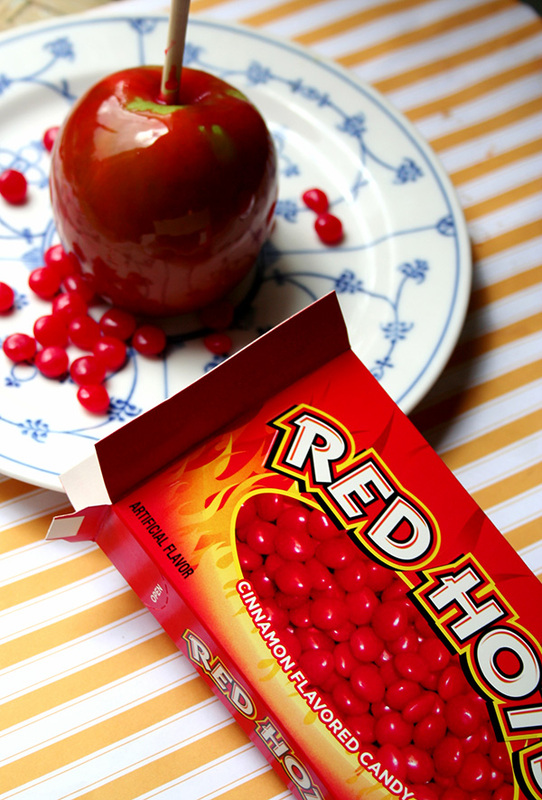 Personally, upon bite #1 I found myself wondering why everyone isn't making candy apples with Red Hots all the time. The sweet-spicy cinnamon candy makes a perfect complement to tart-sweet apples--it is a million times more interesting and tasty than a plain old sugar coating, which is what most candy apples have. Thoroughly wash the apples. Dry, and remove the stems. Skewer the tops, inserting the skewer deep enough so that you can hold the apple upside down and it feels secure. In a medium saucepan, heat the water, butter, and salt until the butter has melted and the mixture comes to a low boil. Add the Red Hots candy and reduce the heat to low. Simmer the candy mixture until it reaches 290 degrees F. This will ensure that the candy is thick enough to coat your apples. Remove from heat, and dip the apples in the candy coating. Place them on your parchment-lined baking sheet. If you'd like, press additional candies on the apples before the candy coating hardens.